The Hanged Man represents the enquirer’s eccentric behaviour, setbacks and suffering. It also shows sacrifice and self sacrifice. 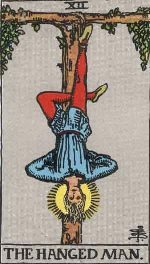 The Hanged Man in the card reveals a man hanging from the branch of a tree. He has placed his hands, which are tied, on his back. They indicate his helplessness. He is hanging by one leg and has positioned his second leg to form a triangle. Strangely enough he appears to be contented and peaceful even in his hanging position. It appears that he has accepted his fate with an inner peace. He has accepted that he has to sacrifice and suffer in order to achieve something or fulfill a mission in life. You have to pay a price to stand by your ideals. The satisfaction derived from achievement outweighs the pain and inconvenience.